Are We Born with Ethics and Morals? Are we born with morality? Do we have a sense of right or wrong from day one? Or are we just blank canvases that society paints on? If put in an extreme situation, could an ordinary person grow up to be a psychopath? 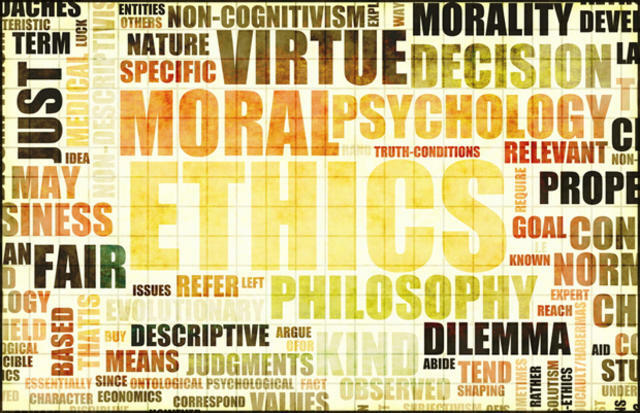 According to the Oxford Dictionary, ethics are “moral principles that govern a person’s or group’s behavior” whereas morality is defined as “the extent to which an action is right or wrong.” Ethics are specific to one group of people, while morality implies moral principles that relate to human beings more generally. For example stealing in general is considered bad and killing people is considered worse. Being kind is good and self-sacrificing even better. At the Infant Cognition Center at Yale University, scientists are running studies to see if babies have an innate sense of good and evil. What they do is they show babies of about six months of age a puppet show. In one show they have a puppet trying to climb up a hill, but he can’t get up it. Then another puppet comes along that helps him up. Then they show it again but instead of the puppet helping him, a different puppet appears and pushes the first puppet down the hill. They run through this cycle six to fourteen times, alternating between the puppet being helped by one puppet and pushed down by another. They then “ask” the infant to choose between the good puppet and the bad puppet. Around 80 percent of the time the infant will choose the good puppet over the one that pushed the other puppet down the hill. Of course the scientists have to consider tons of other variables that could be in play when the baby chooses a puppet, like what color shirt they are wearing or whether they think this puppet is cuter then the other, etc. Since the babies are around six months old, the scientists must also consider the extent to which the babies are already slightly influenced by society. In spite of these factors, and considering the results of related studies, researchers at the Yale lab theorize that babies do have an innate sense of good and evil. However you don’t need puppets or science labs to notice these things for yourself. I’ve interacted with a lot of babies in my life. I am the oldest cousin on both sides of my family and the first child born in my parent’s group of friends. Because I am the oldest I am also the designated babysitter. As long as I have the nature/nurture question in mind and the children to study, I might as well have my own Infant Cognition Center of sorts, here’s one observation I have made. When I explained this situation to a friend, she said that the girl I had talked to might have stopped tormenting the cat not because she empathized with the cat, but rather because she didn’t want me to be upset with her. I agreed, but that only further proved my point. If she had noticed that I was upset with her she would have had to notice the emotion I was portraying in my voice and through the expression on my face. She would have understood how it felt to be me, angry with her and then not want me to be angry. So once again we have a young child who has empathy. Based on my own experience and the research that I have read about I do think that we are born with empathy. That is, we are born with a very basic understanding of other people’s emotions. However, saying that we are born with empathy is not that same as saying that we are born with a sense of right and wrong, and honestly I’m not sure if we are. I do think, though, that empathy helps us from the second we are born to build our own set of moral standards. From day one we are watching how the people around us react to certain situations and from our social observations we get our sense of right and wrong. Maybe we are building on morals we are born with and maybe not, but either way empathy helps us build up our morals and develop as human beings. Sofiy Inck lives in Brooklyn, NY with her sister, parents and two huge cats. Around the corner from her house live Ruby, Jasper, Orna and Nigel with two smaller cats.